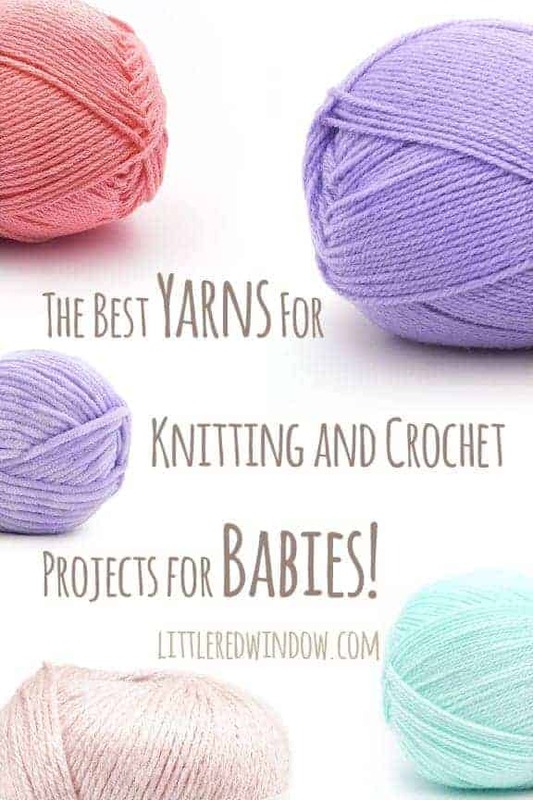 Best yarn for baby blankets & knitting and crochet projects for babies! 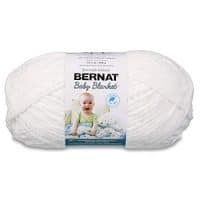 Want to find best yarn for baby blankets? 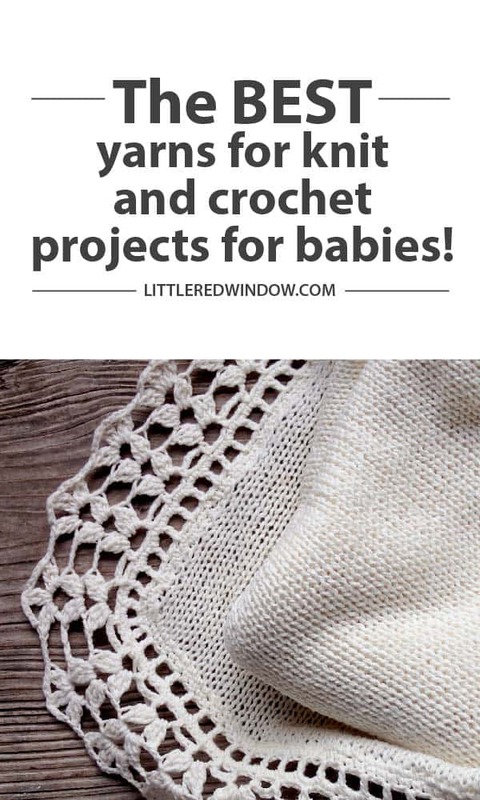 These are the best yarns to use for knitting and crochet projects for babies and kids! They’re soft, durable and don’t cost an arm and leg, you’ll love them! 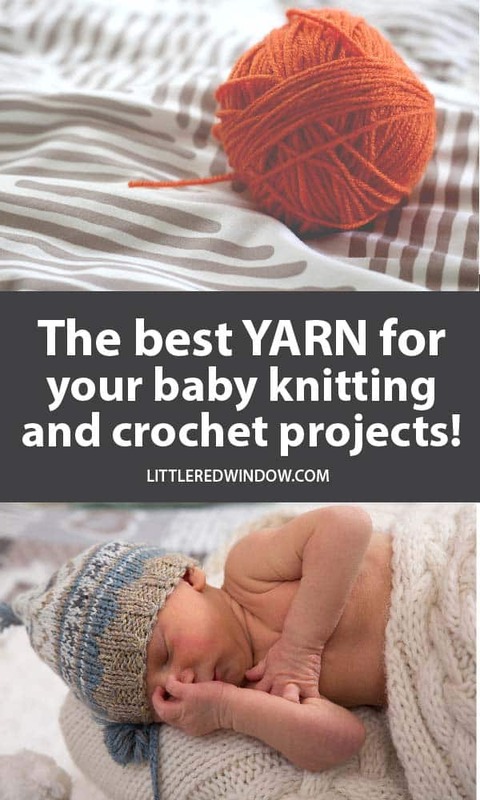 If you’re looking for the best yarn for baby blankets, you’re in the right place! I have quite a few knitting projects for kids and babies on my site, and after doing so many, I’m kind of picky about which yarns I use. While I can definitely support going to your local yarn store and buying some gorgeous superwash wool yarn for baby blankets if that’s what you like, to be honest, I have a hard time doing that for baby projects for a number of reasons. First, babies leak. Spit-up, drool, diaper disasters…you name it, it will get on baby items. So I want my items to be as truly washable as possible. While you can wash superwash wool (hence the name) you still have to be kind of careful with it. But I have tossed acrylic and cotton yarns in the gentle cycle in the washing machine and they’re fine. So there’s that. Plus, when you give a knitted gift to a non-knitter, they don’t know the right way to take care of wool, it’s easier if you just make it foolproof. Secondly, there’s the cost. In a perfect world, I’m partial to alpaca or bamboo yarns that are super soft, they really are the best yarn for baby blankets. But they can also be super SUPER expensive. And while I do want the softest yarn for baby blankets possible, babies wear things and use things for such a short time. And finally, both of my kids have really really sensitive skin. I can relate, I actually can’t really wear wool either. No matter how nice it is, I still find it itchy. To me, wool just isn’t the softest yarn for baby blankets. So that’s another reason I prefer acrylic, cotton, or other non-wool yarns for babies. It’s super super soft, breathable and won’t bother even the most sensitive skin. 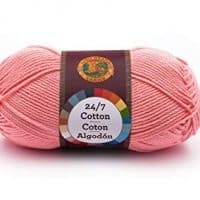 Lion Brand Babysoft, this is a sport weight or light worsted weight yarn, comes in pretty pastels and is nice and soft. Vanna’s Choice, this is my go-to when I want brighter trendier colors. This isn’t quite as soft as some of the other baby yarns but among 100% acrylic yarns it’s pretty good (I find it softer than Red Heart, for example). I use some of this in most of my baby hats. 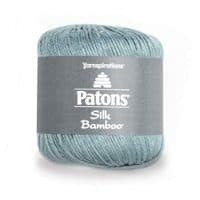 Patons Silk Bamboo, if you want softness, you can’t go wrong with this gorgeous silk/bamboo blend. It has a little bit of a pretty sheen and it’s sooo nice to work with (and only a little bit more expensive). 24/7 100% Cotton Yarn, this is what I go for when I want a natural fiber with no chance of itchiness. It’s less soft than acrylic, but still plenty soft and comfy. Just beware, cotton can shrink. Chenille Yarn, between worsted weight and bulky, chenille yarns are super soft and knit up quickly. Aa’s aunt made O a blanket and a little teddy bear out of a chenille yarn and they were not only beloved but they held up really well and were super soft and snuggly. Thick & Quick Yarn, I’ve been knitting for a long time. But I remember a few years ago, I was buying yarn in my local yarn store and when the owner asked what I was buying it for and I said, “a baby blanket” she got this worried look on her face and said, “do you know that baby blankets take a long time?? ?” Well, yes I did, and for me that was fine. But using a soft bulky weight yarn like this will cut down on the time a lot and make for an extra cuddly blanket. 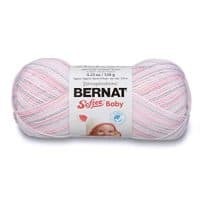 Bernat Softee, I’ve been a fan of the Softee line forever, it has a little more sheen than some other yarns and it definitely lives up to it’s name. It’s super soft and snuggly. I especially like this chunky version for quicker projects! 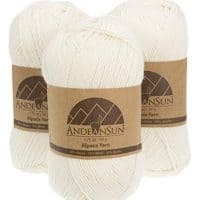 Alpaca yarn, if you want to spend a touch more and get a natural animal fiber, I almost always choose alpaca over wool. 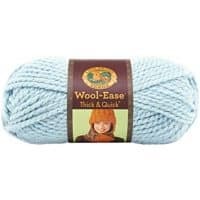 As I mentioned, it doesn’t matter how fancy the wool yarn, it always feels itchy to me especially on my neck, head or wrists. But alpaca has all the beauty of wool with none of the itch! I like this alpaca blend from Patons which is luxurious but a little more affordable. 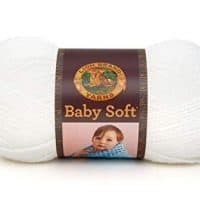 So, there you have it, the best yarn for baby blankets and my favorite yarns for all knit and crochet projects for babies. Do you have any other favorites that I didn’t mention? Choose a washable yarn, babies make messes! Don’t spend a million dollars, the baby phase is short and baby items get used hard. Pick a mid-range yarn that will hold up and look nice but is a reasonable price. Make sure you check the dye lots on your yarn to make sure it all matches! Follow the directions for washing (and pass those directions on to the new parents if the item is a gift). Even if you’re not using wool, cotton yarns, for example, can shrink or colors can bleed! 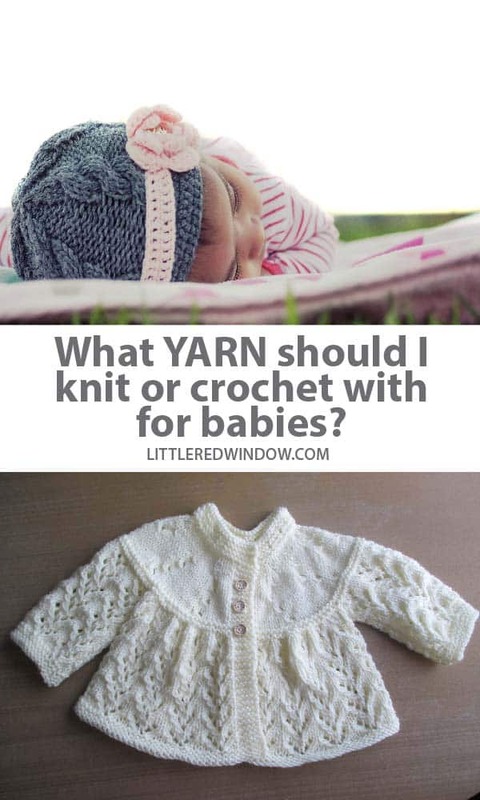 Find out which yarns are the best to use for knitting and crochet projects for babies! This is not a yarn I have used very much myself. Acrylic can pill with washing but I would suggest looking that specific yarn up on Ravelry and reading some reviews from real life users. I can no longer get the lovely soft 100% cotton I used to use for baby blankets. The 24/7 that you’ve recommended … does it feel nice, or is it weigh like crafter cotton? Considering this or the bamboo, but had heard others concerns around care for such a high use item. Thanks anyone who has touched the 24/7 for your feedback! 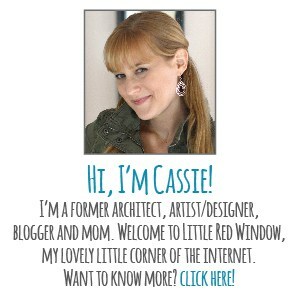 This is my first visit to your site, and I look forward to checking it out. Is there a reason you don’t recommend Caron Simply Soft in all of its varieties? I’ve made many baby blankets out of Simply Soft and have found it to be completely washable and quite durable. I totally agree! Any reason NOT to choose this! thank you for tips of chose material yarn 🙂 . Hi, I was so happy to see you recommended Patons Silk Bamboo because I love working with that yarn. I’m making my second baby blanket with it. Beautiful but expensive. I haven’t heard from the first mother yet how the blanket washed. Since you say in your blog post that for a baby the yarn must be washable, I’m wondering how you found this yarn to wash? Thanks! PS. 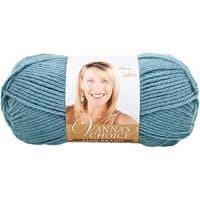 I’m wanting to try an intarsia crochet pattern with Silk Bamboo because of the beatiful definition of this yarn- it looks incredibly beautiful in row after row of single crochet- but I’m hesitant to try a big project like this if it doesn’t wash well. I haven’t personally washed it (used for gifts) but I’ve heard it can get a bit fuzzy after washing, but nothing too terrible! These reviews might be helpful in deciding about your project! Thank you. Very helpful indeed. My daughter is giving birth in October so I am starting up some projects for the little one coming soon. I’m excited to make a baby blanket, booties and hats. I think I’ll go for bamboo yarn. What yarn would you recommend for a baby blanket that will not get knobby ‘pills’ after a few washes. It is sad after doing all the work then to have it soon look scruffy. What size crochet hook would you use for the thick and quick yarn? I don’t crochet very often, but Lion Brand recommends an N 13 crochet hook for the Thick & Quick yarn. Hope that helps! Have you used the 24/7 cotton for a blanket before? I like that it’s wash AND dryable! Not for a blanket, but I love it for a hat. I think it would hold up really well for a blanket! I recommend Lion Brand 34/7 cotton, it comes in some great colors! It makes me so sad that I can’t knit. I’ve tried but everything just gets tied together and not very gracefully I might add, haha. Have you ever tried crochet? For some people it’s a lot easier! I tried knitting & couldn’t get it right, moved onto crochet a number of years later & have never looked back! I used to be a knitter and couldn’t get the tension right for crochet. But after a bit of practice I am now a full-fledged crocheter! It is so much faster than knitting!